Six sculptures were designed by Scholz & Friends for the 2006 football world cup (FIFA). These six sculptures were set in Berlin and made a part of Germany’s Idea campaign; “Deutschland – Land der Ideen”, and were named “The Walk of Ideas”. They were put up for a certain period of time, but made a big impact on tourists who visited the nation for the big event. 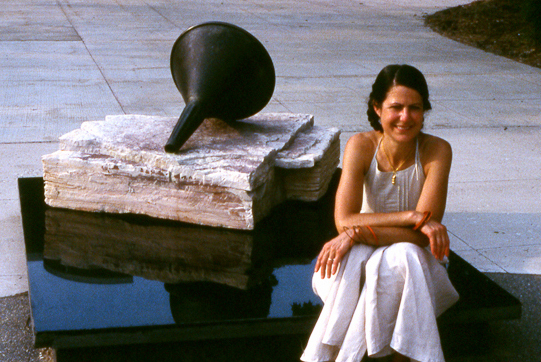 Among the sculptures, there were many that conveyed thought, idea and innovation throughout the country’s history. These sculptures cost about 300,000 euros each from start to finish, and were made with a new kind of material called Neopor. 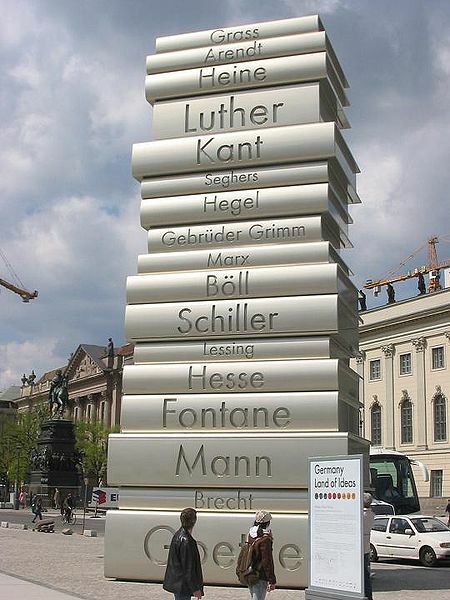 The sculptures consisted of these designed subjects: A series of books with names of German poets and writers, a giant tablet signifying the milestone of medicine, a few huge musical notes to symbolize bach, beethoven and the rest of their musical prodigies, a silver car signifying contributions in the automobile discovery, A modernized foot ball boot, and Einstein’s equation: E=mc squared. The feedback from the worldwide community was simply astonishing. The British Times, CNN and many other coverage media companies broadcasted positive clamour for the overall success of the campaign. As an abstract expressionist sculptor, Mark di Suvero creates his bold, contemporary pieces in a diversity of rigid and curving shapes. Taking inspiration from prime contours and basic elements, he uses heavy metal and steal beams to create arcs, bends and complex shapes that constitute the foundation for much of his art portfolio. Aside from this, another trait that defines Mark’s artworks, are the fact that many pieces within are kinetic. Swivels and rotatable objects are a common find in his designs, giving them a great capability for motion and interactivity. Mark studied at several universities, such as Berkeley, and the Santa Barbara University in California. He was also a recipient of the (year 2000) International Sculpture Center Lifetime Achievement Award. As an avid member of the art community, Mark also founded two galleries; Park Place and SoHo Contemporary Art. Aside from these establishments, his three studios in Long Island, Petaluma, and France are all reputable facilities that work round’ the clock to create his bold gigantic masterpieces. Mark’s aesthetic tendency to make use of large elements like railroad tracks and heavy I-beams makes it difficult to construct art at a normal backyard studio, so he uses these three professional studios at their locations to make his metal creations from start to finish. Recently, he published a book entitled Dreambook which is a compilation of sculptures, ideas and poems. It is highlighted with vibrant colors that reflect on his personal taste. We all know that factories and machinery have the capacity to produce perfect grade objects with flawless surfaces, spotless coats and pinpoint proportion. We are also aware that human beings are not robots, nor are they precise, routinized assembly lines. What happens then when we pit man against machine in the world of art? When you buy an artwork, do you look for every blemish, every tiny irregularity that somehow looks as if it shouldn’t be there? If so, then maybe you’re looking in the wrong direction. Fine decor fits the description on the flawless collection piece, but art for many people is able to transcend this scrutiny of physical quality. Art is humanistic in nature, and is on a caliber of thought and emotion unknown to mass produced works. It really all boils down to what you’re looking for; beautiful objects or beautiful stories. Every work of art is exactly a personal story; a piece of a person’s life and time. Art survives and thrives even through the industrial and digital ages because of its organic and narrative nature. It does not need to be a porcelain doll every single time, because it ought to reflect on the presence of humanity in the world. Art creates a perfect story within every imperfect shape it possesses. Many people always say that the mind of a child is like a sponge. It’s very absorbent of any strong information because at this stage, it is crucial for the brain to gain new cognitive function so as to further human development. The recognition of art is no exception. What catches a young person’s senses first is usually subconsciously registered as one of the primary traits of dominance. Bright colors, deep contrasts, large masses of form & striking patterns- these are some of the elements that visual artists can utilize to capture the attention of the younger generations. This type of advice can be very easily related to painting, but when you apply it to the artform of sculpture, what aspects other than physical size can one notice? Well, balance is definitely something to consider, have you ever seen a sculpture that looks like its free standing off a pin-sized point? Or an artpiece that looks so dense in its material, but is stationed to look as if it’s flying? Imagine the kind of sight that would bewilder you to the point of asking the question: how did he do that? Or how is that possible? Younger people are drawn to things that are both striking in theme and unexplainable in existence. It’s not a mystery to know what to make, it’s a mystery itself that you have to create. Mysteries draw attention. Ankara’s Resim ve Heykel Müzesi (The State Art and Sculpture Museum) was a brainchild of Mustafa Kemal Atatürk, the first president of the country. Its semi-regal architecture came from the design of Arif Hikmet Koyunoğlu in 1927. The building originally exhibited a lot of 19th century art from the country’s artist community. The modern museum now restored and declared re-open to the public is a heritage center that creates a doorway into Turkey’s past and present artistic personalities. Along with an extended library dedicated to the plastic arts, the museum also features spaces where guest exhibitions can be held as well. The restoration of the building gave it prime conditions to create a sound environment for the preservation of every artwork. The architecture and settings prevent problems due to temperature, humidity and the like. Aging damage can also be repaired within the museum grounds at a special restoration area specifically tasked for this purpose. The entire complex is laden with controlling systems that also signal for fires. Workshops that the museum currently offers are vast in number and are mainly about sculpture, painting, traditional printing, ceramics and the ornamental arts. The level of workshops may also vary, as people have demanded to create two levels of professional and beginner. The Turkish museum holds many multi-cultural and multi-platform exhibitions in cooperation with foreign countries. Three of its galleries are reserved for periodical exhibits to showcase he work of foreign artists, and permanent pieces from the Turkish corner will be traveling to be displayed in other countries as well.